We’re inviting you – for a limited time only! – to take part in a big experiment! For our first ‘Zooniverse Lab’, we’ve partnered with NASA, who are training astronauts in an underwater environment. For the next two weeks they’re sending six astronauts, researchers and habitat technicians to live in an undersea habitat and work as part of the NASA Extreme Environment Mission Operations (NEEMO). We’re interested to see if having many eyes on the problem will help the scientists and engineers working on NEEMO. The mission is taking place 43 feet underwater at the NOAA ‘Aquarius’ facility, three miles off the coast of Key Largo, USA. The goal of this NEEMO-15 mission is to understand how NASA may one day explore and operate on asteroids, using techniques that are orders of magnitude more capable and efficient than methods are in use today. For the Zooniverse this is the first of a new breed of project for us – one where the experiment is the interface itself! The project will only run for two weeks and in that time we hope to collect sufficient data to work out if an interface where people confirm or reject each other’s classifications can prove more efficient than our current approach of purely independent classification. NASA science teams will be using the data collected during NEEMO-15, alongside your classifications, to help develop different data sampling techniques for future asteroid missions. Although we can’t promise that this project will result in academic papers, it will aid the NEEMO project and we’re convinced that it can help us better understand the limits of citizen science online. 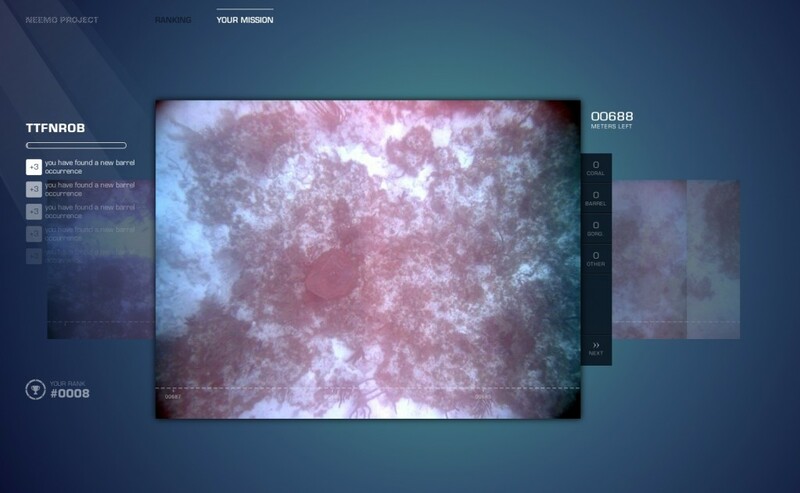 Check out http://neemo.zooniverse.org and let us know what you think. Cool experiment but the interface doesn’t work 100% of the time. Some times the box around what you have found doesn’t stay after you click on “submit” and whatever it is isn’t added to the count of the appropriate thing on the right of the picture. I find leaving the site and coming back helps. I notice the site is in Beta and it is clear there are a few bugs to iron out yet. The pictures don’t always load, but maybe that’s me. This looks really interesting, but I am not getting past the loading screen. Is anyone else having this problem? Help. Where can we post our suggestions/remarks etc ? Is this project finished ?